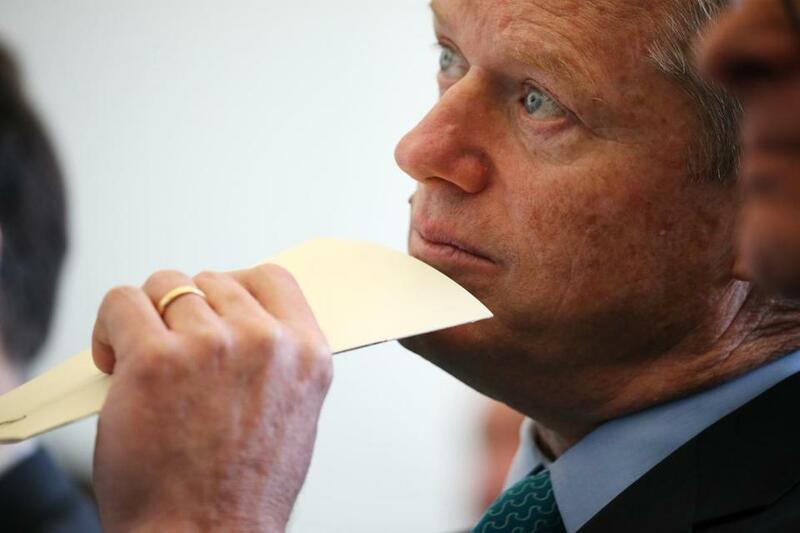 Governor Charlie Baker, in what should be a triumphant celebration of his first term and a strong launch of his reelection race, will face pockets of raucous resistance at Saturday’s state Republican convention from his party’s more conservative factions. As 2,300 delegates gather in Worcester for their annual confab, they are expected to force Baker, a moderate Republican who distances himself from President Trump, to grapple with the party’s anticipated endorsement of state Representative Geoff Diehl, an outspoken Trump ally, in the US Senate race. “It is ironic, Baker and Diehl represent the two sides of the spectrum of Republicanism in Massachusetts,” said Stonehill College political professor Peter Ubertaccio, describing what could well be the party’s lineup coming out of the convention. All candidates, including Baker, must get 15 percent of the delegate support to compete in the Republican primary on Sept. 4. Baker, the heavy favorite for the GOP’s endorsement and nomination, will have a direct challenge from Scott Lively, a Springfield pastor and fringe candidate. Many Republicans say Lively is close to that 15 percent hurdle, while Diehl is expected to get the 50 percent needed for an endorsement from the party. Diehl, a far more mainstream Republican than Lively, will be competing with two candidates who are selling themselves as moderates in Baker’s mold — although the governor and his political team are not involved in the intraparty contest to field a candidate against US Senator Elizabeth Warren. Diehl’s competition includes wealthy financier John Kingston of Winchester and longtime GOP operative Beth Lindstrom of Groton. Lively’s small but vocal support — and to a good extent, Diehl’s strong showing — represents deep suspicion and anger among the conservative pro-Trump base of the party, many of whom say they feel aggrieved over how Baker has purged them from the party’s organization and embraced a moderate agenda in his first term. GOP insiders say Diehl’s strength in the convention is rooted in his strong appeal to the antiestablishment conservative base of Republican activists that normally dominate the state conventions, but have less influence in the state primary elections. Diehl’s role in helping to lead the 2014 fight to repeal the gas tax, as cochairman of Trump’s Massachusetts campaign, and one of the state’s biggest cheerleaders for the president has given him a base within an ideologically driven faction of the state GOP. That, according to veteran GOP activists, is almost sure to guarantee the state lawmaker the endorsement. Diehl’s campaign argues that, on a ticket with Baker, the four-term Whitman lawmaker would provide the governor with major inroads into areas of the state where Trump had strong support. “The governor needs Geoff to bring new people to the ticket, particularly from the Massachusetts Rust Belt, where Trump won,’’ said Holly Robichaud, Diehl’s chief consultant. The party-wrangling has emerged despite Baker’s popularity in public polls and $7.9 million political bankroll that dwarfs all Democrats’ campaign funds combined. Baker rankled conservatives when he spent nearly $1 million in 2016 to gain a majority control of the 80-member Massachusetts Republican State Committee, which governs the party. Mary Lou Daxland, a longtime Republican activist from Westport and delegate for Lively, said Baker is facing a revolt from pro-Trump social conservatives who, among other things, are upset by the governor’s support of a transgender rights bill, his refusal to back Trump, and his recent snubbing of Vice President Mike Pence during a local fund-raiser. “Conservatives from all over are just wild about that,’’ said Daxland, a former state committeewoman whom Baker targeted and defeated in her re-election to the party post. She said the opposition is strong enough to get Lively the 15 percent vote: “This could easily get him on the ballot,’’ she said. The Baker reelection campaign declined to respond directly to the resistance it faces headed into Saturday’s event.